Watching a little OU women's basketball on ESPN. I'd forgotten my sports bone, but madness is bringing it out. Maybe I'll be a better college sports fan next year. I think we'll be better NYU women's BB fans/start going to games earlier in the season. So, the Norway trip off - need to discuss but FYI. Some tax issue - basically NYC taxes were never taken out of my check (and believe me, NYC charges a high price for the privilege of living in relative squalor) so I have a big payment to make in the next couple weeks. Shawn's solution was cancel this trip, so that's the plan. I've got a passport though and will travel if the opportunity arises. I've also got a week's vacation already approved. Somehow I don't imagine I'll be actually taking it off. Hrm. I've been awake since before 6 today and slept only a few hours on Sunday night as well. Haven't really been eating well - no one to blame but myself. But come on. It's hard to get it together when together consists of sitting in a room alone on a phone or e-mailing. Webcamming tonight because tomorrow we're going to see a play. Owen is getting more interactive - he sent me kisses through the computer (but they came out of the duct tape behind me instead of my camera! what kind of silly goose thinks of that???) 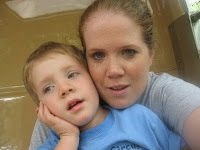 and he told me about trains, how they work and his favorites (steamies like Thomas). He also knows quite a bit about the Statue of Liberty - when Beth was here I bought him a book about it at the Scholastic Store in SoHo. OMG he's the cutest (and he's never going to say OMG again!) ... I can't wait for Easter to go give him a SQUEEEEEEEZE! I finished this book in the wee hours today. I inhaled it, loving the writing and topic - a girl's life. She happens to have an artificial leg, which is a theme of the book without overtaking it or being obtrusive to the shared experience of life. A Strand find that I'm happy I bought. HAHA - just cleaning out my camera with pics I've taken this spring - mostly for the Shawn birthday one. I photoshopped the salad dressing spot off my dress (I can't eat w/o spilling something). 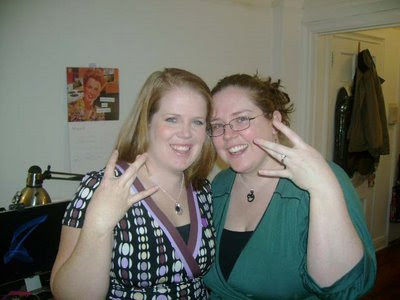 This is Beth and me right before we left to see West Side Story. Aren't sisters fun? One of our rituals/routines is to have brunch after church at Cozy Soup & Burger. It's featured in Big Daddy and there are some signed pictures of random actors. We once saw the dad from Mad About You (Burt Buchman) in the restaurant. He's pretty old though. Anyway, today we were in ear shot of a couple ~25 year old guys. They were talking about relationships and it was all I could do to go sit down and just stare at them and listen intently. One apparently cheated on his girlfriend and was trying to justify it to the other friend - "I couldn't stay in a relationship that made me unhappy" (emphasis mine), etc. He also talked about being a serial monogamist. Give me a break. Later the other guy (I got the impression he did not have a girlfriend) was talking about how he wants to be married and have a kid when he's 30. "That means I'd have to be engaged by the time I'm 28," he said in an almost panicky voice, which made me bust out laughing. What a girl thing to say. But I guess men and women do worry about the same things - finding and securing love for life, stability and security and in the end, happiness. I'm pretty lucky that I've got that with old Shawn. 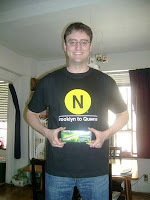 Here's a photo of him on his birthday, wearing his new "N" shirt from Beth and with the green laser pointer from my mom. The cake I baked him didn't turn out so great, although it tasted OK. But our steak dinner was pretty nice and we are planning to go to a play next week to extend the celebration. I bought him a math textbook he picked out. Yep, he's a nerd. But he's my nerd! i should be better about titling my posts. meh. am waiting for shawn to get home from his trip. it's rainy outside. basketball on tv - background noise i guess. m-e-h.
33. Do a Twitter search for tweets on a particular subject - display them together on your blog (compile in photoshop). Create bullet points of trends you notice at the bottom of the post. Hrm. what would be my twitter search? wow - some interesting stuff on crochet - a way to find fellow twitter crocheters. (your results will vary when you click through) I don't think I've ever tweeted about crochet. What do I tweet? NONSENSE and a bit of retweeting things I find of interest. Egads. It's been a rough three days to say the least. There's a lot of draggy information I could vent about here, but HELLO inappropriate! Something that is sharable - TRAGEDY STRUCK ... well, it was at least an inconvenience and will end up costing some DOUGH. My laptop back light died ... the evening before my work's big event ... when I had about an hour of work to get through. So the laptop is toast I think (it's old, has bad associations, etc.) - although I will be able to get off any information that's on it - it would technically work as a computer with a monitor. But I also back up everything onto the portable hard drive (well, for the most part). And I should be OK on that end. But that wasn't the worst part - the worst was not being able to finish my work and having to go into the office at 7 am on Tuesday to get the press releases issued, bla bla. I didn't get all the changes made that I would have liked, but I got it all done today in my last day in the office. It was a long day. Adding the Metro ride back to the hotel - it was a 16+ hour day (left the hotel before 7 am and got back after 11 pm). So I made it through another year's event. I survived and there's work yet to be done. PS When I told the laptop story, a coworker said "it's worse than bedbugs!" And I said I would take 100 days like Tuesday over the ordeal of bedbugs. And I absolutely mean it. Bedbugs are the worst! I've got my new-ish rolly suitcase (previous one was a victim of the bedbugs) packed to the gills with clothes because I can't decide exactly what to wear and I want options. I've got my heavy laptop in a backpack and a separate pocketbook/purse with items to entertain me during the trip (book, crochet, iPod) and my wallet and tickets. so for a three night stay i've got three bags of stuff. UGH. what's wrong with me? but i guess if i'm the one who's lugging it i can take it. i wish i had a smaller lighter laptop. that would cut out a bag right there. meh. Church today was amazing. I was so glad I went. The sermon was about John 3:17 - the next verse. Everyone has memorized 3:16 but who knows about "the next verse"? Anyway, it's basically that Jesus came not to condemn people but to SAVE them. And by extrapolation, we should work to save people not condemn them (no saying "you're going to hell" or the like). That's something I love about the UMC - the open hearts, open minds, open doors policy/theme. God loves everyone, including me. Including YOU! Pretty good news, huh? Before I depart, I will re-cap my sister's visit. She arrived Tuesday and our arrival at LGA was perfectly timed. As I stepped off the bus she was stepping off the plane and we met in the middle at the security check point - literally neither of us had to break stride. It was amazing. Taxi home and then out to a Mexican restaurant on St. Paddy's Day (you wouldn't believe the crowds on Bleecker!) ... but we figured margaritas and guac are green, so we did our part. On Wednesday during work Beth did a little shopping in my neighborhood - the paper store on 18th, H&M and such. She also made it down to Pearl River. Wednesday evening was our big outing and the reason for her trip to NYC... WEST SIDE STORY. I was wrong that half of the dialogue and songs were translated to Spanish. Only two songs and a couple scenes were entirely in Spanish and for the most part I could keep up. Like I said before I was still stressed about work (and continue to be - this is the least fun weekend of the year!) but she was SO happy. Before the show she bought a "Sharks" t-shirt, which was good because they sold out! And on the way out she picked up a poster (which I got in the mail to her yesterday, among my many errands). I want to be in America!!! Unfortunately "I Feel Pretty" was in Spanish - so that was a bummer. Otherwise the show was awesome. I LOVED the costumes and the singing and the story (I hadn't watched it since high school, although it's a movie Beth watches regularly). The only REAL bummer was how much we were gouged for our tickets. Basically we paid almost triple the face value, but there was no other way to see the show (sold out) even thought I bought the tickets WELL in advance. It was the day before opening night/the last of the previews. I still think it was worth it and Beth does too. On Thursday afternoon we did a bit of shopping - Grand Central train store to get a "4" train for Owen's set, Sephora to look for Barbie makeup (they didn't have exactly what we want so I'll order online for her birthday in July), then to B&H Photo, where she got a new camera. Then we had a break and a coffee and went back to my neighborhood. Originally we were going to take the subway out to the ocean, but somehow we decided not to do that. We ordered Chinese food (pretty yummy) and then went for a drink at a Karaoke bar and got sort-of hit on (if having a guy sit on your lap and touch your arm counts as being hit on). We didn't last long there and came home and crashed. Then Friday morning she was back in the air on the way home. A too quick trip that was too filled with WORK! Time to get going. Fingers crossed that I get through this ordeal with my sanity and that my heart can be filled with kindness and calmness. HA! You might be feeling quite pleased with yourself today because your creative energy is running strong and it's easy to express yourself however you choose. But even if the setting is perfect, something still prevents you from having as much fun as you wish. Letting go of your previous expectations can help, but the ultimate solution will only come with time. There's no need to be in such a hurry, so slow down and enjoy the present moment. I could delve into that and explain why I think it is pretty close to truth. But meh. Happy spring equinox. It was snowing today in NYC. Geez. A light bulb blew on one of my few lamps. It was 100 watts and I've only got 60 watts to replace it. Waa Waa Waa. They're filming in my neighborhood today - The Sorcerer's Apprentice with Nicolas Cage. Kind of exciting BUT there are trucks - as in MACK Trucks - idling outside my window - all day long (all day yesterday too). Doesn't make for a conducive work environment, especially given my current state of mind, work load and pressure level. Beth's at her gate after a whirlwind trip. West Side Story was great (although work didn't fully leave my mind even when seeing the gorgeous dancers and their full skirts swishing on stage). Wish I had more time and energy to catalogue her entire visit. Maybe this weekend, which will be cut short for work travel, but none-the-less I'm looking forward to it. Only two days until my little sister arrives for a visit. She gets in after work on Tuesday, and we have tickets for West Side Story on Wednesday evening. I'm a little nervous about the changes to the original play - half of the dialogue and songs are now in Spanish... I don't speak Spanish but I hope I can enjoy it just the same! Because of the timing of Beth's visit in relation to work (a week from Tuesday is the big fund-raising event, which leaves everyone including me in a frenzied blur of work this week especially), I won't be able to take off a lot of time to spend with her during the days. So on Wednesday and probably most of Thursday she'll have to explore our neighborhood and/or visit a museum on her own. (The good news is she's quite independent and will enjoy the shopping to be had around here - she has a mission to visit the paper store on 18th St.) BUT, I should be able to get away on Thursday afternoon for a ride out to the ocean - just for a look, or perhaps we'll choose to visit the Empire State Building. Her flight home is Friday morning, so I'll be doing any last minute work all day after her departure. Then I travel to DC for the event on Sunday, and will be away until Wednesday the 25th. I may or may not be able to blog extensively ... just depends on several factors I guess. A bit more travel coming up in May (two weddings! ), followed by our belated honeymoon-type-trip in June. Time is really flying on our newlywed year. So struggling for blog identity is a bit like self identity I suppose. I could focus my writing a bit more, be less haphazard. Write about city escapades? (Focusing on the "hate NYC" market - HA?) More about the things I read and think and say? I mostly think about work though. Hrm. Newlywed blogs abound, and there's a lot being written about nesting and fun stuff like that (I read some of course), but I don't nest anymore. I hope to again someday, but for now I'm just roosting - getting through. Crochet is a minor part of my life, not something I could write about even weekly. I just use this blog to share my finished projects and some works in progress. HA - when I looked at my blog stats (for the first time this year, I'm really not a good social media person on this end) the top keyword was something like "Mari Shawn Harry Potter" - yeah not a lot of people I don't know come to this blog, but most of them who find it via keyword did so with those?! 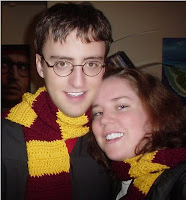 Anyway, here's the photo I would think someone would be looking for if they searched for "mari shawn harry potter" or "Mari Shawn Harry Potter" or some variation thereof. (Including adding "silvermari" to the mix) And yes, I do know that only people who DO know me (and Shawn) would know to search for this! 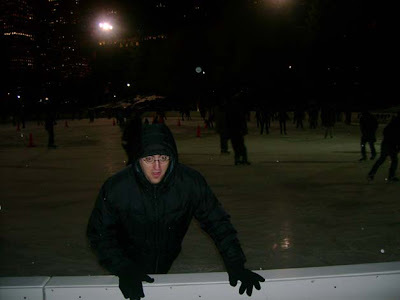 This post is created using a recommendation from a recent "how to blog" post I shared. One problem I have is that my blog doesn't really have a theme, niche or strong direction - it's basically a self-scrapbook, which is fine, but never going to help me improve my social media skills in a real, meaningful way. So here we go and we'll see how this affects traffic and such. Isn't experimenting fun? Last night I sat in on a class at Columbia as part of a work assignment. My main (personal) take away was I miss school and I miss reporting. BUT not enough to make a life change. The professor told me journalism PhDs aren't a good idea (duh, squared - if I were getting a PhD, I think I'd pick economics and work in some media angles there - but that's not happening, my Mrs. degree was first then Mommy degree next, knock on wood). I'm realizing that the key to being truly happy in New York City is to get out as often as possible. waiting on groceries to be delivered. it's a gorgeous day - just the right temps and overcast. grey days always make me ... hopeful i guess. i watched The Women this morning - the original 1939 version. hilarious. i really should watch more older movies. recommendations welcome. i didn't set out to watch this one, but of course daylight savings time screwed me up and i missed church (how lazy must one be to sleep past 10 am when she's almost 30?). but this was on turner classic movies and i just started watching it. so good. and not a man in site, which was one of the funniest things, especially since everything the women spoke about were ... of course ... MEN! ah, l'amour. there were some very clever lines. then there was a protest parade that went right by under my window. i suspect it had something to do with the triangle shirtwaist factory fire - which happened within view of our apartment window. it was definitely a woman empowerment parade ... but i couldn't really understand what they were saying - it was just LOUD. Cut chicken into strips, and put in a baking dish that has been sprayed with cooking spray. In a bowl, mix all other ingredients together. Pour over chicken, cover with foil, and place in refrigerator for a least 1 hour. Bake in oven at 375 for about 45 minutes. The strips are marinating or whatever in the fridge. Going to make some corn on the cob, sugar snap peas and cornbread. yummo! I'm starving just thinking about it. Man, superfun times at the NYU basketball game. The ladies beat Salve Regina (which is located in Rhode Island - who knew?) ... Shameful that there weren't many students there. The opposing team had more fans it seemed. Tomorrow the team plays again, and it's SO worth the $6/pop at the door. Seriously! Broke my favorite, homemade mug. Just the handle, but still. This week has been awful. I am going to try to superglue it. DE-pressing. My eye is MUCH better. Really the scratched cornea takes 24-48 hours to heal, and I'm definitely healed. Huzzah. But I'm still giving myself time off from contacts. Ugh. So much for the update. Meh. A patient comes into the adjustment room with a sock on his shoulder. The doctor just thinks it's static cling but tells him it's there. He flushes and has to tell her this story. As he was getting dressed, he put one sock on and then noticed he needed to trim his toenails. So he took the sock off and slung it on his shoulder, did the trimming and couldn't find the sock/didn't remember where he put it. So he just got dressed and put on different socks. He went through his ENTIRE day without noticing a sock on his shoulder ... and that means no one told him about it except the doctor. This was too long to tweet, so typing it out. I'm going through the Lenten devotional from PAUMC. Yesterday's was good and touching - about Abraham Lincoln and the failures he endured before success. "Our world is blessed with the success the comes when we are where God 'wants' us, in that place, all our prior failures are understood as preparations for becoming agents of the great blessing." In an idea stolen from Keep Up With Me, I thought I'd do a list of loves and hates today - including describing just how my day when yesterday (hint: my eyes are still gummy and don't want to be open). Love - the look of snow, falling and blanketing the passing country as I speed by in the train. Hate - freezing train travel (when the doors are kept open by the previously mentioned scraping); I was so cold for the entire 3+ hour ride (and we all know I'm NOT cold natured) ... maybe it had something to do with my feet getting cold on the walk to the subway (no cabs to be had out there you know) and never really warming up! Also train delays - my return train broke down THREE (3) times. I had finished early and caught an earlier train than I expected, but I ended up getting to the station a mere 20 minutes earlier than I would have had I stuck with my original schedule. Sheesh! it's shawn's birthday month - hooray hooray! tomorrow i'm doing something crazy again - another down and back trip to work. i just don't understand why i do these things. anyway, i have to get up at 5 am tomorrow - my train leaves Penn Station at 6 am, so I'll have to hustle. Ugh. i'm so not a morning person, so not sure how i'll really survive this. i don't return until 10:30 pm - meaning a full day work with the looooong train rides tacked onto either end. but i'm doing it for the annual report and wanting to be a part of the printing and press check. should be good - but i DREAMED about the trip last night, basically dreamed i went into work, did all my work and was checking off everything and realized i'd done everything EXCEPT go to the press check. lame. so because i'm leaving at the crack of dawn tomorrow, i decided to check my work email just now. ugh. normally work email doesn't fill me with such distress. none of the emails required a response (so it would have been better to not check at all) - and i can deal with it when i arrive at the printer's and have some email time there. And the even better news - a giant snow storm is supposed to hit the east coast (including the NYC metro area) tomorrow - meaning even lovelier travel for me, i'm sure. BLUGH-a-mug. Maybe I'll end up traveling on a snowy Thomas the Tank Engine?! UGH. There's nothing left to say at this point. One thing that's often said when someone is baptized is "Remember your baptism." Baptism changes you - not only by the water symbolizing the washing away but by the Spirit literally changing you. So I thought I would reflect on mine. This memory is only what's in my head - although I'm sure I could locate a hard copy diary with notes to REALLY jog my memory, they've been hidden away in a closet until our next move. I was baptized in ~October 1992 (pre-boy craziness so I don't have the same memory for dates ... although somewhere there's a baptismal certificate with the exact date - I think I'm right about the year). I was eleven - and it was a very conscious decision. My parents made the decision not to christen or baptize me (or my sister) as a baby, leaving it up to me. I respect that a lot, but I'm not sure that's what I'll do with my kids (but that's another entry I guess). So, OK, I'm eleven, almost twelve. My sister was baptized at the same time, and she was ten. For some reason we had decided that the typical Methodist sprinkling-on-the-head wasn't enough (or maybe the decision was made by someone else, but we more than went along with it). We needed to be DUNKED. So, the pastor baptize us in a church in a nearby town that had a baptismal tank (not sure that's the right word - but there you go). We went after church one Sunday with our family and some of our church friends. Another girl was also baptized with us (and in a stunning only-in-a-small-town kind of soap opera, she turned out to be the girl who stole that very first boyfriend from me ... well, before I stole him back anyway - again, another post needed if I'm going to delve into that). She was probably nine at the time of our baptisms - definitely two or three years younger than me. Aside from the baptism, the boyfriend and 2 vague childhood memories (one of a trampoline/pimento cheese sandwiches and one of a cardboard box house with a flashlight for a light fixture), this girl who lived in the house behind ours played a very minor role in my life. But she was there and important on this particular day. My main memory of the event itself - aside from the life changing affect (as much as an 11-yr-old's life can be changed) and soul-filling experience - was after the fact, when my sister and I were changing out of our wet clothes after being submerged. I know that I forgot to pack dry underwear, and for some reason I think my sister did too - although I can't be sure of that. This was before going commando was even an idea in my head, and having just been baptized would I have really gone without undies?! So we (or I, if she had dry undies) made the decision to just wear the wet ones, which of course were so wet the soaked through our jeans. That led the pastor to talk to my mom and me ... in a very joking way saying "I thought I was the only one who would do something like that!" So how about that? The most vivid memory of the most important day of my life ... is wet underpants.